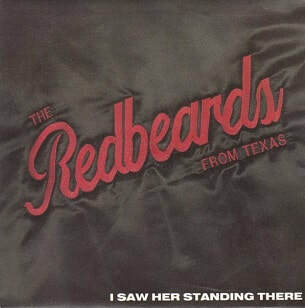 I Saw Her Standing There is the debut single from the British rock band The Red Beards from Texas, released by Receiver Records in May 1986. A cover of the 1963 song by the Beatles, it was written by John Lennon and Paul McCartney, with the Red Beards from Texas' version produced by Jim Lea. The song would be included on the band's 1987 album Havin' a Ball. In a 1986 fan club interview, Lea spoke of how he came to get involved with the band: "Well, Dave knows the bass guitarist. The band originally played pop songs, and as part of their act did this send up of ZZ Top. This went down such a storm, with their big hats and red beards - it was a real piss-take. They were called "The Flying Doctors" in those days. My brother Frank got involved through [Dave], and he asked whether I wanted to go into the studio with them. I went to see them last Christmas when they sold out two nights at JBs in Dudley. Frank took me to see them again a couple of weeks later at the Dome Disco in Birmingham and they were totally against the odds. They went on with their silly hats and beards, and I realised then just how competent and good they are. They won the audience over, and they only did three numbers." The beginning of 1986 saw the announcement by the Slade fan club that Lea was in discussion with the band on producing a version of "I Saw Her Standing There". Lea and the band soon recorded the song together, with Lea producing it. Released in May 1986, the single failed to chart, although it did gain radio airplay. Inspired by the near success of the single, Lea would produce the band's follow-up single, "Gudbuy T'Jane", a cover of the 1972 Slade hit. In a 1986 interview, Lea said: "We did "I Saw Her Standing There", though totally re-arranged, earlier this year, which made a dent, so I am here now doing the follow up single "Gudbuy T'Jane"." The band performed the song on the ITV children's music show Razzmatazz. "I Saw Her Standing There" was released on 7" vinyl by Receiver Records in the UK only. The B-side, "Poker With the Boys", was an original track written by the band. In 1987, both "I Saw Her Standing There" and its B-side would appear on the band's only album Havin' a Ball.